Microsoft released KB4103714 yesterday; the update for Windows 10 version 1709, the Fall Creators Update, brings the build number of the system to 16299.461. It is the expected update for Windows 10 version 1709 after the releases of KB4103722 and KB4103720 for Windows 10 version 1607 and 1703 last week. It should not come as a surprise, therefor, that the update for Windows 10 version 1709 contains some of the improvements that the other two updates included.. The update KB4103714 is available through Windows Updates. You can run manual checks for updates on machines running the version of Windows 10 to have it picked up immediately, or wait for the system to discover and install it automatically instead. Note: running a manual check may download and install Windows 10 version 1803. If you don't want that to happen, download the standalone update from Microsoft's Update Catalog website instead. Note that you need to install the Service Stack Update KB4132650 prior to the new cumulative update for Windows 10 version 1709. Use the keys Windows-I to open the Settings application. On the Windows Update page, select "check for updates"
Download any update that is discovered. The changelog on Microsoft's website lists a large number of improvements and fixes. 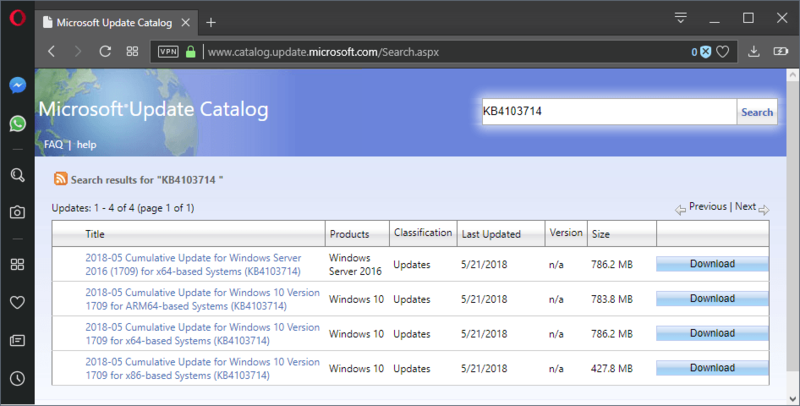 KB4103714 is a non-security update for Windows 10. Tip: It is often better to wait with the installation or deployment of non-security updates because of Microsoft's recent track record of releasing updates with bugs and issues. Unless you are affected by an issue and need it fixed asap, you are usually better off if you delay the installation of the update. Applications like Microsoft Edge stopped responding when creating new audio endpoints while audio or video playback started. Fixed touch keyboard not showing up reliably in some instances. Fixed an issue with UWP apps that use local crash dumps and Disk Cleanup or StorageSense not cleaning the logs. Fixed a BitLocker going into recovery mode issue during the installation of updates. Addressed an issue that caused expired VPN certificates to not be deleted which resulted in application performance drops. Addressed performance issues when multiple processes are limited by rate, using job objects. Fixed a issue where Windows 10 clients failed to apply Group Policy permissions, run scripts, or retrieve roaming profiles when authenticating to 802.1x WLAN access points. Added support for SameSite cookie standard in Microsoft Edge and Internet Explorer 11. Updated time zone information issues fixed. Internet Explorer dialogs appeared on the primary monitor and secondary monitor with extended display. Microsoft Edge issue fixed in remote sessions. Reliability issue fix with textboxes when using a Japanese IME and .NET applications. Bluetooth devices failed to received data after a restart. Fixed a Performance Monitor issue on systems with a lot of processors that prevented the creation of new performance counters. Fixed authentication issues in Windows Authentication Manager. Fixed Windows Authentication Manager issue that caused it to stop working when making server requests. Addressed a Windows Authentication Manager token cache invalidation issue. Fixed a timeout error when disconnecting VPNs from systems in Connected Standby state. Display explicit errors when plugins fail to connect to prevent timeouts. Addressed an issue in the DiskShadow utility. Fixed the cause of the error "The data is invalid. (0x8007000D)" when using Virtual Machines. Fixed the error "hcsshim::ImportLayer failed in Win32: The system cannot find the path specified." with docker builds. Fixed issue in RemoteApp sessions that caused clicking in the foreground window to become unresponsive. Addressed a issue in RemoteApp sessions that resulted in a black screen when maximizing apps on a secondary monitor. Fixed application association issue in DISM tool. Microsoft did not list any known issues on the changelog page. Now You: What's your experience with recent Windows Updates? Microsoft released KB4103714 yesterday; the update for Windows 10 version 1709, the Fall Creators Update, brings the build number of the system to 16299.461. It is the expected update for Windows 10 version 1709. > Download any update that is discovered. Hah. It’ll download whether you want it to or not! Martin, can you or one of your readers please explain why it is necessary to install a service stack update before installing a cumulative update? Thanks. Why oh why can’t Microsoft not use the build number as version number? It would make things easy instead of the number mess it is now. Because of Microsofts incompetence I’ve had to resort to convoluted manual updating of my PC running win 10 home. Now I have to manually download security updates, disconnect my network cable, temporarily re-enable the wupdate service, install the updates manually, reboot, disable the wupdate service again, then reconnect my network cable. Doesn’t install for me (using the MSU). Update history still shows other updates In the pipeline like kb4093112 &4103727 to just mention a few. Tried to remove updates via Setting/uninstall Updates but don’t get choice to actually uninstall them. The update was suspended? does not appear in windows update. On a PC with AM2 Gigabyte mobo, this KB crashes a few times (blank screen) during update. When Windows is finally running, get blank screen after 15 seconds of uptime. Runs fine after backout to previous restore point. And yet, it updates and runs fine on my other AM3 Gigabyte PC. Reminds me of the CPU fix that I had to skip on AM2 CPU by applying another KB, not too long ago. Wonder if MS has that CPU fix included in this cumulative fix which does not work for older CPUs !!! Follow-up on KB4103714 crashing PC with AM2 chipset. Upgraded my AM3 with new 1803 without problem. Need patience as this is a huge update. After a week, I cross my fingers and attempt 1803 on AM2 after turning Windows Update service back on. It skips the dreaded KB4103714. Takes about 8 hours to complete the preparation, download, etc. Leave the update/restart to next day in case it needs to be backed out AGAIN!!! Don’t want to lose any sleep over this. Next morning, update/restart works fine. Need to reset my background on monitor. PC has been idling for past hour without crashing. Now, I see the CPU busy doing some background activities. That’s it.